Boynton's Feathertop Winery, near Porepunkah. Nestled between Victoria’s snowfields and the Murray River, tobacco was once big business here but now the region boasts a bounty of varied providores. 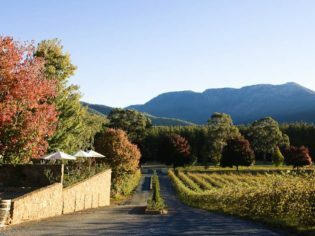 Characterised by winding alpine roads, green flats and wineries tucked into hillsides, the scenery is almost as good as the food. Almost. Milawa Blue is a must if you stop off at the Milawa Cheese Company. This small but multi-award-winning fromagerie in the tiny township of Milawa produces handmade cheeses in their historic butter factory, using traditional, preservative-free methods. Be prepared to loosen the belt after sampling their morish Milawa Blue. A newbie to Milawa’s food scene, this grocery-and-café-in-one stocks the most extensive range of local produce around. As many small producers don’t have a shop front or cellar door, Snow Road Produce is a one-stop shop for collecting local goodies from Milawa organic beef, Rutherglen lamb and King Valley free-range pork, to fresh vegetables and an array of local beers, wines and ciders. Much more than a winery, Pizzini is also a haunt for local sweet tooths. Matriarch Katrina Pizzini makes a mean Rocky Prosecco Road, which you can buy at the winery or learn to create at their popular cooking school. Brown Brother’s Winery Epicurean Centre in Milawa. Locals reckon King Valley eggs are the best in the country. Pick up a super fresh carton from their roadside stall on the Glenrowan-Moyhu Road, or find them at the Moyhu Farmers Market, held on the third Saturday of each month. Not a typical pub stay, Mountain View Hotel claims to be a ‘boutique gastro-pub’ situated in the heart of King Valley. Rooms are well-appointed with king-sized beds and LCD televisions but we’re rather fond of the restaurant, which champions local produce with a European flavour. From $135 a night. Each of the light-filled guest rooms overlook local vineyards – though once you snuggle into one of the fireside armchairs or your king-sized bed, we dare say you won’t be focusing on the views. From $229 a night, including full breakfast.